Full ‘out-of-the-box’ curriculum for Key Stages 3 to 5 built around projects inspired from industry and developed in collaboration with teachers. Resources include editable lesson plans, classroom and homework tasks with answer sheets, powerpoint slides, assessments, and supporting 3D models. Working with industry partners, we take projects and challenges they face on a daily basis and distil them into curricula. Integrating multiple technologies and combining them with industry information provides students with the opportunity to develop technical and soft skills, while being inspired, motivated, and better prepared to make future choices. 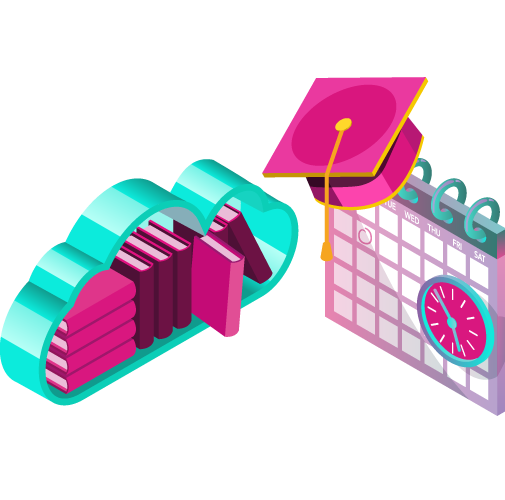 Our curricula can be delivered either throughout the year in 10-13 weeks time-frames, or as condensed 3-5 day project-based workshops that can count towards assessment. 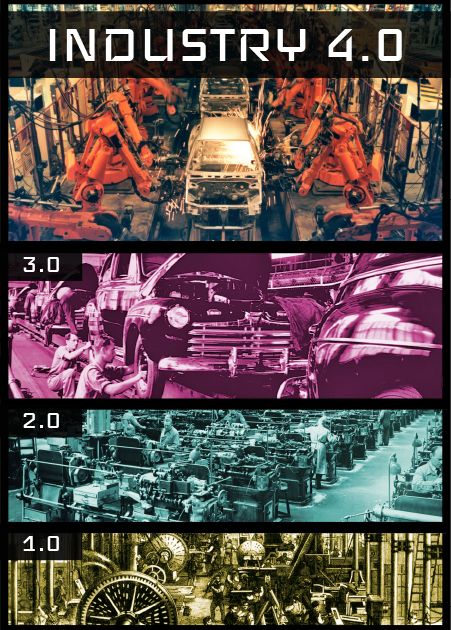 We currently have 3 main industry themes: Space, Ground, and Industry 4.0. Each contains multiple projects and variations. We are always working to add more. If you are interested in working with us to create new educational experiences, please get in touch. Nature is the oldest research and development lab. Many problems, especially engineering problems, have an answer in nature. Through biomimicry, students design and build a rocket from the ground up by drawing inspiration from aerodynamic shapes found in nature. They will learn about physics, biology, 3D design, and 3D printing. Advanced lessons include adding accelerometers, altimeters, cameras, and building rocket launchers. As costs of launching satellites into space are directly linked with their size and mass, picosatellites are taking over! These are small satellites of around 10cm³ packed with sensors and capabilities that allow them to connect to each other and form networks in space. 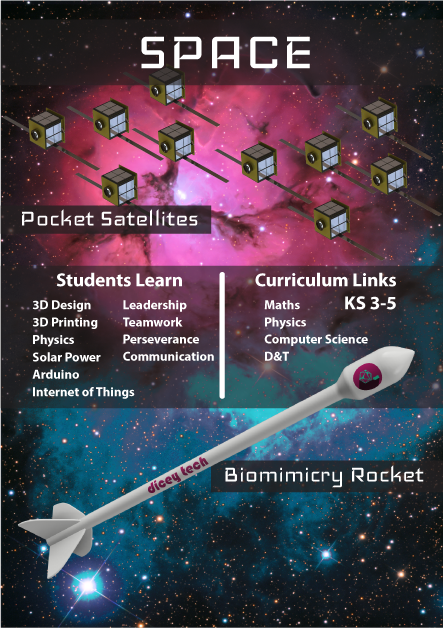 Through this curriculum, students learn to design and build a pocket cube satellite exactly like the ones currently in orbit, including performing low-orbit operations like deploying solar panels. This draws links with curricula in physics, mathematics, computer science, and design and technology. Building vehicles of all shapes, sizes, and fit for different purposes, students learn about the fundamental components of automobiles and experience key tradeoffs and challenges professionals face on a daily basis. This engaging curriculum can be taught in the Design and Technology curriculum and it links with Computer Science, Physics, and Mathematics. 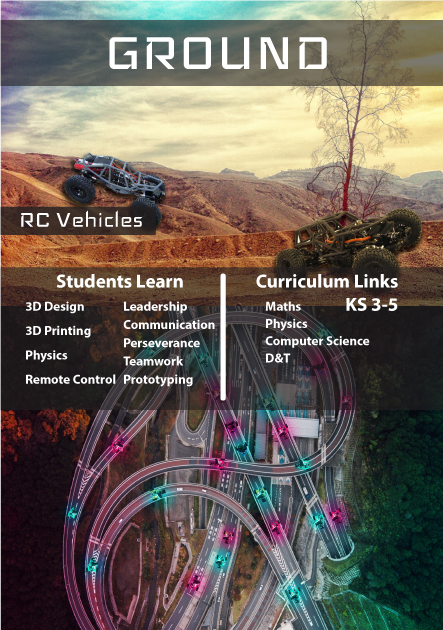 Advanced lessons include adding sensors to create autonomous vehicles and connecting multiple vehicles together to create swarms. Industrial revolutions are born at the intersection of advances in different technologies, usually energy, transportation, and communication. They have always preceded short recessions followed by huge economic boosts characterised by more, better quality jobs. In this curriculum students explore the depths of manufacturing, design, and engineering, including various processes and how they are changing through cyber-physical systems. Using design, robotics, and sensor technology, they will identify industry requirements and create smart robotic solutions as part of their final assessment projects. Advanced lessons include using graphical interfaces for representing different systems, and developing advanced IoT solutions for production processes.